Triip has blockchain at its core, which is why we’re integrating two currencies in to our system. Today, there are 6,000 authentic local experiences, tailor-made Triip tours across 100 countries that can be booked with ETH starting. 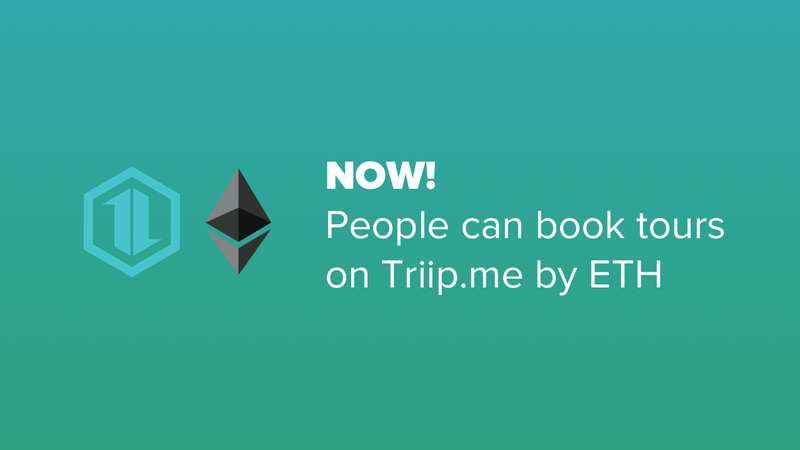 Those who book tours on Triip from the 15th of December to the 15th of January get a 5 percent discount when the payment is made through ETH. There are only about 500 businesses in the world that honor ETH as payment. By accepting this currency, we’re leading the industry in blockchain adoption. And we’d like encourage Triip’s travelers to be part of the movement too. We’ve always been a blockchain-centered company, though that has come at a cost lately with the overall downward trend in the cryptocurrency market. There isn’t an easy way to say this so we’ll start with the marquee figure: blockchain currencies are down to about 80 percent of their market capitalization compared to a year ago. For everyone to succeed in the new, post-fiat economy, the industry needs to reach mass adoption of cash alternatives as Michael Casey argues in his CoinDesk column. There, he also said the buzz and hype around cryptocurrencies have in some way become a hindrance to popularizing the idea. The market needs stability and a substantial growth before it can become a formidable competitor to traditional cash, Casey argues, and that doesn’t happen through blockchain billionaires but through common people using TOMO to book a Triip tour, for a example. If there’s a place that’s going to lead the establishment and maturity of cryptocurrency, it’s our side of the world. In a recent HackerNoon post, Apolo Ohno of HybridBlock pointed out that one of every three South Koreans own a cryptocurrency. The Asian market overall is friendlier to speculative investments than Westerners. We’re in the right location to do what we’re doing. We stand at the intersection of a lot of things that we feel share strong synergy: not only the overlap between blockchain and the Asian market, but also that of cryptocurrency and travel. The travel market is a US$1.2 billion market, and it has the potential to outperform even this figure if we can reduce the number of intermediaries — payment processors, advertising platforms, et al. — with yet unchallenged roles in this market. Casey finishes his column on what he calls the “crypto winter” by arguing that the time has come to direct our efforts as blockchain advocates to public education. We need understanding and buy in from more than just those who already have a crypto wallet. For us, the price of Bitcoin or any other currency is just a figure. For those who believe this technology has world-altering potential and are working to making this a reality, there must be a higher mission that drives our work.